You don't need to spend additional money at the bait and tackle store. You can easily grow your own fly larvae (maggots) for fishing, with a few household supplies and a little bit of patience. Creating your own bait-maggot supply also allows you to monitor the size and quality of your bait and choose only the best when it's time to go fishing. Place the raw chicken breast onto a sheet of newspaper. Place one to two inches of wheat bran into a container. Place the newspaper, with chicken on top of it, on top of the wheat bran, but do not fold the paper over the meat. Place the lid on the container, but do not secure it tightly. The flies need a place to enter and lay their eggs, which will become your fishing bait once they hatch. Locate the container in a quiet spot outside where it will not be disturbed by people or wildlife. Check the chicken breast every few days for signs of fly eggs. They will look like tiny white dots, often clustered together. Continue checking on the container until you are satisfied with the amount of eggs you can see. Wrap the newspaper loosely, but securely, around the chicken breast, to keep the maggots and their feed (the chicken breast) protected, and tightly secure the lid. Punch tiny holes in the lid, using a safety pin. This will allow oxygen to reach the growing maggots but keep other flies and pests from entering. Check on the container every two days until you see that the eggs have hatched and the maggots look like plump, short, white or beige worms. At this point they are ready to be used as bait. Clean the maggots off, to prepare them for fishing, by placing them in the colander or sieve under warm running water for about one minute. Fill the second lidded container with two inches of wheat bran. Transfer the rinsed maggots to the second container with the wheat bran, and mix them in gently. Cover with the lid. 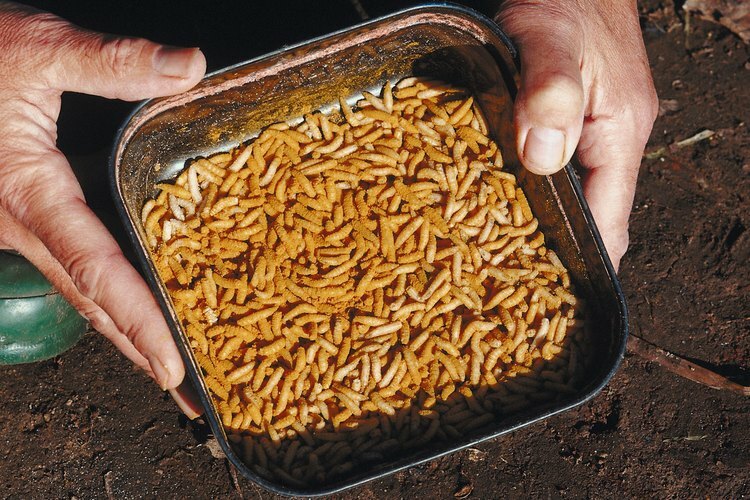 Store the maggots in the refrigerator until you're ready to use them as fishing bait. Be sure to keep the chicken breast and maggots away from children and pets to avoid illness. Any raw meat can be substituted for the chicken breast. Be sure to wash your hands thoroughly after handling the meat and maggots. Discard leftover rotten meat, bran and newspaper in an outdoor trash can to avoid bringing fly larvae into your home. Handling raw chicken or meat can spread bacteria and viruses. Be sure to wash your hands and any tools that come into contact with the meat or the maggots very thoroughly in hot, soapy water. Fly-fishing-basics.com: Don't Throw That Cheese Away! Based in Baltimore, Summer Reibert has been publishing since 1999. Her work has appeared in "Baltimore Citypaper," "The UB Post," Patch.com, and literary journals. She co-authored a technique manual for a women's health and fitness dance studio. Her Bachelor of Arts in English and professional writing is from The University of Baltimore.